Home Animal Diversity Brittle stars stealing from Jelly fishes! 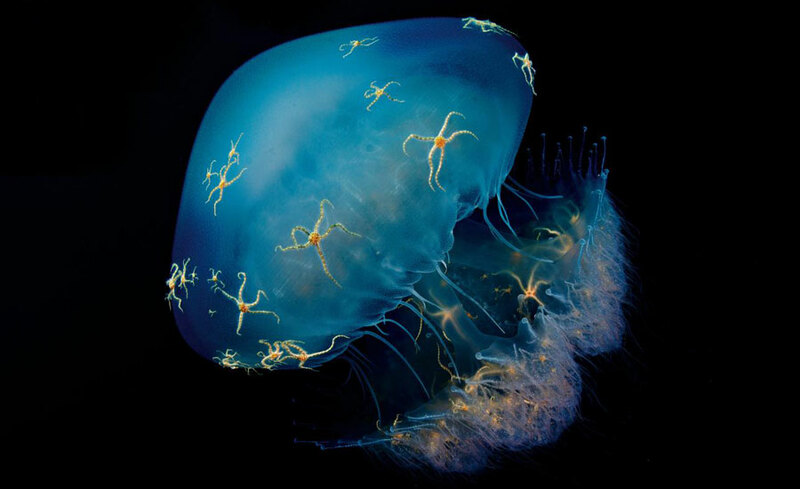 Occassionally, brittle stars are seen in the body of jelly fishes. They are usually present under the bell or on the oral arms. But they are not seen on jelly fishes in cold to temperate waters. Interesting fact is the food sources of brittle stars seems to be mesozooplanktons and they were never observed with arms out in water. Then, where do they get their food from? They take food directly from the mouth or the oral arms of the jelly fish. It means, they are stealing food from the jellyfish which are pelagic predators. There are several reports of other brittle stars moving down into the feeding arms or near the mouth and stealing food directly from the host. So these are called as KLEPTOPARASITES.